It’s January & It’s Summer! It’s January, it’s hot, it’s Summer! We didn’t have one last year. She must have unilaterally decided to give my part of the country a miss, I believe it wasn’t personal, she just had other places she would rather be. So there has been unbounded joy in this little corner of the world – long hot days followed by long warm dusks. It is just now getting dark about 9.30 pm, light by 5.30 am. And my word, you should see my garden! It’s a jungle out there folks, no room to sit and sizzle in the hot sun, it’s been taken over by tomatoes and salady stuff and petunias and lobelia and sweet-peas – let’s not forget the sweet-peas! This is his ‘Whaddya want mumma?’ face, because I whistled him and he stopped what he was busily bumbling about with and rushed up to me. As a complete aside, a few days ago we celebrated Siddy’s ninth month birthday. He has stopped visibly growing, thank heavens. He is much calmer now, he loves his mumma very much, adores Orlando and his aunty YD is his most favourite person in the whole world – but should he meet you, you would immediately become his next favourite person in the whole world. Siddy’s joy and enthusiasm for life and people remains unabated. It is just tempered with slightly better manners these days. This tiny garden, organic and companion planted, growing mostly in buckets and tubs is in good looking condition – but something has been eating my peas! I’m picking them this evening, ready or not! My ‘rhythm of life’ – that thing some of you refer to as routine – has suddenly disengaged. It erupted! I knew it would. I signed on for a year long art course last October. I’d been waiting since mid-May for the signing date to arrive because I knew I needed and wanted to focus on developing myself as an artist. I don’t usually refer to myself as ‘an artist’ – I say I ‘muck abart with mixed media’ or ‘I paint’. Some folks have thought that means I’m a house painter – [which makes me smile because I spent years decorating my homes with paint, now I do it with mostly fabric] and start to ask me which paint is best for this or that problem – or even offer me a job! Anyway – having taken that little meander off subject, let us return …… the art course has started. It started for me on January 2nd, with a bang I might add. Immediately I fell behind as I had, coincidentally, been asked to act as an honorary ‘colour advisory consultant person’ and I was a bit caught up in that process. 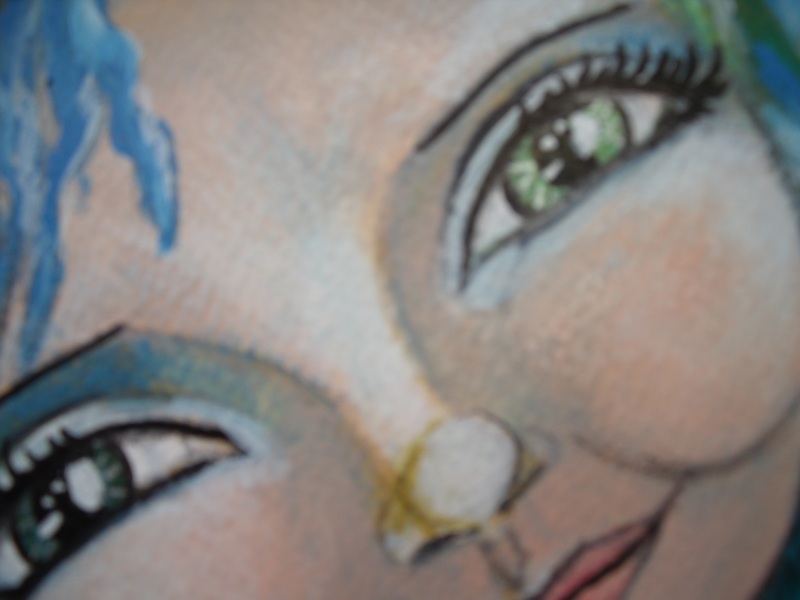 If you follow my progress with mixed media you will see a huge improvement in the way the paint has been applied especially to the face – I learned so much in just the first lesson! I was so pleased with the result of this first exercise that I set myself the task of doing an older more Contented Crafter version – here she is underway, but with a LOT of work still to be done. What do you think? If you have noticed me missing from your blog, or missing with my usual long and opinionated ramblings in your comment section all the above is the reason why. Suddenly there is not enough hours in the day. I wasn’t so busy when I was still a working girl! [Ooow, did that sound wrong?] I’m still doing my best to read everyone’s posts – I always feel that if you took the time to write and proof-read and insert photos and anything else you do on each of your wonderful posts, the least I can do is participate fully! I just can’t fit it all in at the moment – But, like Arnie, I will be back! Life is warm, it is busy, it is very happy. Life is good! I hope you are enjoying all your busy moments too. This is my 150th post and I just recently went past 350 followers. Most don’t read, but to those who do, who come by regularly and leave your endearing messages of support and cheer, thank you, thank you, thank you. You warm my heart, encourage me in all kinds of crazy directions and inspire me daily. This entry was posted in Creations From My Craft Room, Daily Life and tagged bavarian crochet, companion planting, crochet, gardening in a very small space, growing in buckets and tubs, Life Book 2015, mixed media painting, organic gardening, painting in progress by thecontentedcrafter. Bookmark the permalink. Pauline, you have energy to spare! Summer weather suits you. Your garden looks smashing. Such vibrant colors, healthy greens and nice little peaks at the planting tubs there all in. I love your montage. It shows off the color and variety beautifully. I hope you’ve had a decent harvest of peas before they were noshed completely. Did you ever discover the culprit? I’m glad you have Siddy along for good company. Delighted, too, to hear that he retains all the wonderful puppy qualities, but with manners. Score, Pauline, and Orlando. I wish you could tuck him in your bags and bring him along. Sweetie pie. Pauline, your art is magnificent. I adore your work as you already know and have always thought of you as an artist. I’m intrigued that you think of this as a new moniker. I hope you’ll continue to wear it proudly. I keep scrolling back up to gaze at Beacon of Light. She’s beautiful, and perfectly named. The eyes have it for sure. One of the hardest things to paint or draw. Congratulations on two wonderful pieces. The ‘older’ Contented Crafter has such character in her face: the full lips, the cheek bones, the eyelashes, all wonderfully bring her alive. Clearly you’re enjoying your class, the artistic process, and the long, warm, light days in which to enjoy all three: gardening, crocheting and painting. 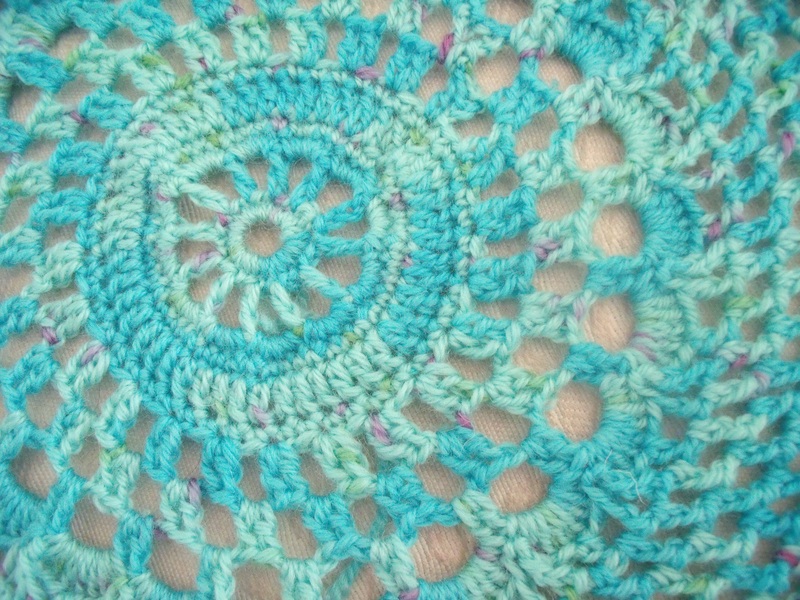 The aqua circles are beautifully stitched. Are you making place mats? There are many wonderful comments here, so you may have already covered this, but I didn’t see one. 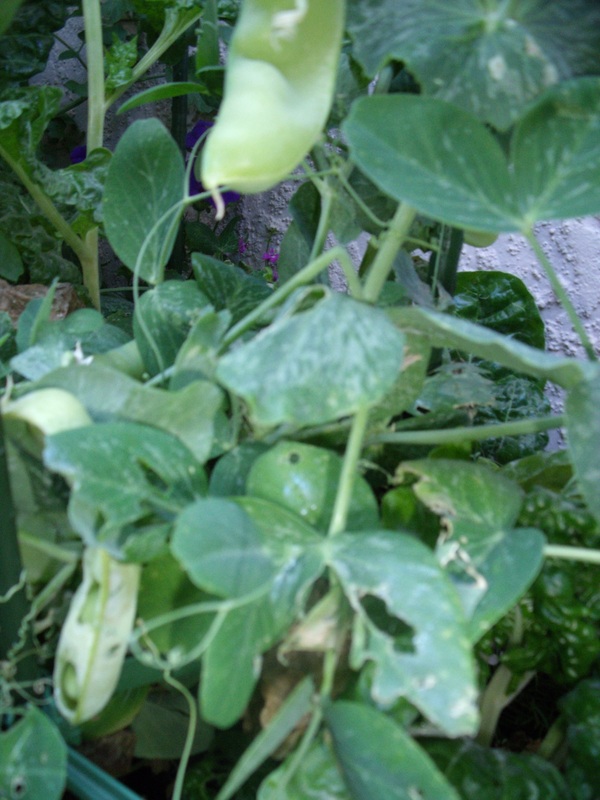 I think it was snails eating my peas – I think that as they are the only critters I have found in the garden. They had actually only eaten holes in the pods and the peas were untouched so I harvested enough for a good serving of peas cooked in mint along with some new potatoes and a salad and then I sprinkled raw peas into salads for the next couple of days. There is another wee crop ripening now. Not bad for six plants, and half of them mostly smothered by the front three that hogged all the sun! There’s a lot of purple in my garden isn’t there – I think it’s because my colour choices are so often influenced by the word ‘blue’. If I could get ‘blue’ nasturtiums I’m pretty sure the orange and yellow splashes of colour would also be purple! The Beacon of Light is essentially my take on someone else’s work [Tamara Laporte’s] – so I can’t claim it as an original in any sense! It was our first lesson and it fired me up so much, just due to the learning curve and sense of accomplishment I got from faithfully following the steps in the lesson [which I always think is the best way to learn] and all the time I was making it the second painting was hovering in the background waving and smiling at me. She was pretty much formed from the word go and there was no  prevarication in her creation! I just hope I haven’t peaked too soon! *** I adore the way Stevie Nicks used to dress and her style now is still attractive to me. I just never had the opportunity when I was working to ever be more than slightly quirky in my garb. Oh my goodness Pauline! What beauty you have been busy creating. Your paintings are wonderful and the eyes so expressive. I am happy i can live vicariously through you with your description of the lovely summer and your colorful gardening. Keep going my artful friend! Thank you Patty! So lovely to see you back here. I am indeed enjoying a most eventful, happy and very lovely summer! It won’t be too long and it will be your turn again! I am so happy for you, Pauline! Your garden is so pretty and your dog looks like he is smiling at all of us, the little imp! You have a really impressive talent in capturing lovely images in your artwork. I think this one is adorable and maybe you should keep her, after checking out how she went, I could see the second one being the beacon of light and this one representing sunshine and glowing hope. I know you wished to ‘evolve’ her and redefine her, but this one speaks to me, too! I love her sunny look, Pauline. You could do a series… smiles! I’m glad you like them Robin! I love how you always have a suggestion for what I could do with my art and my photos and so on – it is most encouraging – and amusing because I’m pretty sure I won’t. 🙂 But never say never! I am so glad you don’t mind my thoughts and input, Pauline. I can see how it may be annoying, so really happy it is not taken as criticism. Instead you take it as constructive suggestions, Pauline! i am one who reads books to children (grandies) and someday, I would love to illustrate a children’s book. A workikng girl and a painter, you lead an interesting life. 🙂 I don’t know about a painter but you are most definitely an artist! You have no idea how jealous I am of you right now. My yard is frozen solid, I am bundled up to stay warm (because I refuse to turn up the heat) and I so want to be busy as I can only be when it’s summer. How wonderful that Mother nature didn’t forget your corner of the world a second year in a row for summer. Let’s hope she doesn’t forget mine this year as she was sorely lacking last summer. Enjoy your art course and don’t worry about keeping up around blog land, I know I’ll still be here when your world slows down and I am sure many others will be too. My gosh, there are a lot of nice visiting going on here. I had to scroll and scroll and scroll just to get down here. Congratulations on your following Pauline. Your compact oasis really does look like a jungle. How cool is it too that you’ve done a good bit of it in tubs and pots. That’s quite amazing. It’s all a site for sore eye’s for us northerners. We’ve just come out of almost two full weeks of really cold weather. This week we’re to enjoy temperate 0C or even 2C. It will feel like a heat wave. I do have a bit of a party when I post, it’s really fun and I love that so many people come by and join in! Sometimes it stops me from doing anything else though – a wee challenge I have to find my way though or round . Everything is going well Boomdee and I am feeling so blessed I can’t tell you! I need to get the next post written and shared I think! I’m hoping it wars up to above C rather than below for you very soon and that it all starts to ease back. I can’t believe how quickly our light is changing – it’s not really light now until nearly 6 am and yet only a couple of weeks ago it was light at 4.30. I’m turning on the light at night about 9 when I could head off to bed at 10.30 and still not need a lamp except to read by. Nice! Those long days of summer, we get them till the end of June then it slowly turns around again. Party on Pauline! Oh my-can’t keep up with posts lately, I am always behind! :-) I try to get other things done now,too + not linger on the comptuer for hours reading-LOL. To much stuff to do. Light out at 9:30, AMAZING! we are dark by 5pm and the days are getting longer-yipee, we have turned the corner and spring is up ahead:-)…use to be dark at 430…so it is not too far off! wow, summer looks amazing in your garden! Just beautiful. I know + I find I miss posts for I am not at my computer as much these days. When it warms up I am finding myself being pulled away in the direction of more projects…but they involve my plants + people!! !…I do enjoy stopping by and seeing what you are creating. I love the color! Your girls are like flowers in my garden:-) they make me smile:-) Keep Painting and Growing! There’s so much summery beauty in this post, that I hardly know where to begin in my response. First, please give Siddy a big, over-enthusiastic cuddle from me right now, because he doesn’t strike me as someone who wants to wait for anything. And then please pass on my respectful bow to Orlando, which I assume he will accept as his due. Your little garden has so much more green than my fractionally-less-little garden had all last summer: I’m in awe of your green fingers. And as for the art course, you should be teaching it not taking it. You are much kinder to me Twisted than I am to you 🙂 It must be your good English upbringing by those sterling Senior Twisteds! Siddy would waggle his rear half until it touched his nose he would be so delighted at any thought of a cuddle with you. Orlando I am sure, would open half of one eye, twitch an ear and fall back to sleep as you respectfully backed away. As to the course – man you should see the talent there! I’m in the lower ranks for sure! But so inspired – you have no idea! I just put another post up with the second painting finished, that’s how inspired I am! Good heavens, Pauline, you are incredibly busy! But it must be wonderfully satisfying to have remarkable tangle results from your efforts. I adore Beacon of Light. Wow. Just wow. I wish you months of beautiful weather where your garden will be as abundantly prolific as you are, and if there’s even one soul of your followers who aren’t taking the couple of minutes to read and gaze at your art then they are missing out on seeing true joy on the page. Soldiering on Shelley! Second painting finished today – I’m marching! Another post up. I’m firing on all guns!! 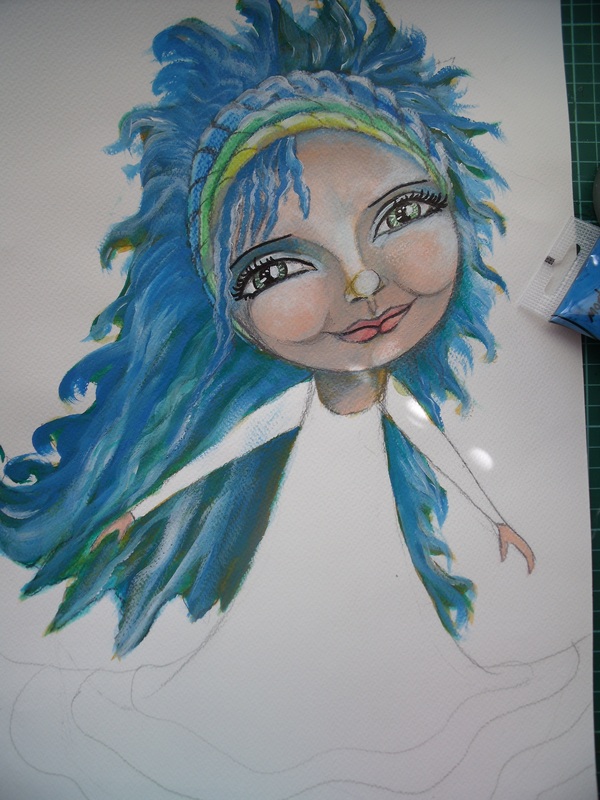 Started work on the third project this afternoon – I’m on fire!! I’m also feeling ever so slightly manic. Might be time to take a quiet time out 🙂 Thank you for your glorious enthusiasm, it so lifts me up. The garden looks wonderful, no doubt in part due to Siddy’s efforts in the undergrowth. I liked your pictured very much, first glance at the second one and I thought it was Liz Taylor. Enjoy your Super Summer while I sit here waiting to see if the forecast for snow is right. Siddy waddles through the undergrowth in a determined and busy kind of a way – so I am sure you are right. I am so glad you like the paintings – the gentlemen who read my blog posts so loyally are usually noncommittal on my art work 🙂 And my second version – Maybe I’m channeling Liz – Ha now there’s a thought! Thank you for tweeting out my posts David, that is very kind of you. I have a twitter account but never use it. Although I am most comfortable in the other three seasons of the year, I’m really enjoying this summer because we haven’t had a decent one for years and didn’t have one at all last year. It was cancelled apparently. Today it is raining for the first time in weeks, so the respite from the heat is welcome. I’ve eaten my peas – they were so delicious! I really need to plant more lettuces and suchlike as most are now finishing and the other stuff is seeding. I’m hoping the tomatoes come to something. I planed three or four and can’t sort anything from anything now they are all so big and inter-mingled. I maybe need to plant less next year 🙂 The sweet-peas are going bonkers. I pick and give way and pick some more. Ha! Goes to show what a small place this is – I buy my DE from him and he delivers it to the door. Funny chap and I didn’t know he kept a blog. I’m following him now [quietly] The cooler pads at Bunnings were $15 for a medium size one. Given the wonderful cooling effects and the sharing of it that goes on – I’d say a steal! What are “DE’s” when they are at home? His blog has a lot of very interesting and useful information about farming practices, making cheeses etc. I think that is a steal for a cooling pad and we will be hunting to see if our local Bunnings has one when we next hit the city :). Diatamaceous Earth – it is good for pest control in the garden – internal parasites in your doggies [Itsp a day mixed into their food] Internal parasites in you 🙂 Grows strong fingernails and hair and helps keep the gut clean. He has some pretty pictures of the crystals on his blog – but it comes in powder form. It’s also good for pest control in your chookies. I sprinkled some into my compost bucket and it keeps the odour down – a magical miracle substance. Just make sure you use ‘food grade’ not the other stuff that is used for cleaning swimming pools! I have diatomaceous Earth, just never knew it was paraphrased before ;). It’s great tossed into the hens nesting boxes as it upsets lice ;). I buy mine from the healthfood shop so I know it’s good stuff. Have you ever thought of trying the bokashi system of composting? It would be really good for your needs. I pinned a couple of recipes for homemade bokashi mix as well as how to make your own bokashi buckets which would save a FORTUNE in the making. Let me know if you would like me to go hunting for the pins (and the subsequent websites 😉 ). Um ……. YES! i looked into Bokashi about a year or so ago and the cost was ludicrous! Any tips would be wonderful! Please, when you the time do go hunting! Heres a list of the links that I pinned regarding bokashi and doing it yourself. I got very excited about it but then realised that I have a big property, a big 20 litre bucket for compost (that I fill twice a week!) and I can just trundle it up the back to another big compost heap inside Sanctuary so it went on the back burner. This is a Youtube video about making your own bokashi mix for cheap. I am guessing the “clay” is a type of kaolin clay that you can get at your health food shop, the rest is easy peasy to get hold of. You are a fabulous, fabulous woman and you got spammed – but at least they told me this time 🙂 As soon as I get a chance I shall be looking carefully into all this. And hopefully making me some lovely compost over winter again! This is the year of learn or bust Sharon 🙂 Siddy IS so sqeee! 🙂 Aren’t I just the luckiest puppy mama!! I don’t have to tell about published books anymore. That was decades ago now. It was a CAREER that had the potential to let me stay home and raise kids and make money and have prestige and it worked. So why, 30 years later with all the books out of print and me not involved anymore with that world, is this identity still in place? In the 90s, I was a social worker and I downplayed my children’s book writing past, not talking about it. I was a social worker who could write. Then I was an activist (for Dennis Kucinich) and a farmer. Now I’m retired. I’m making a home off-grid in Hawaii, I say. I bake lots. Writing is for pleasure and recreation. It’s to process life and play with Keith. I was a bit confused about what I created, the interest in writing (in order to impress) or the career. Writing is an interest and an ability I’ve been attracted to all my life. I didn’t create that interest, but I’ve used it successfully. I think you should write a post about this thing – it would be such an interesting discussion! Thank YOU, Pauline, for your thoughtful response. You have a gift for response, offering your own experience as well as truly “hearing” the writer. 🙂 Mahalo. We are many layered, as you say. I love the poem “The Layers”, as you know, and still recite it to myself weekly. I, too, have reacted to the question “what do you do?” which means there’s something there for me to learn, eh? It’s interesting the image of artist you conjure for yourself. The bohemian beret in an attic at an easel. What is your image of a writer? Mine isn’t so positive — narcissistic, ineffectual, poor posture. Methinks I need to work on this. 🙂 As for a blog post, we’ll see. I’ve put in a request for the narrative line to the writing goddess. Love those drawings Pauline! Siddy is adorable (I whispered that because Snoopy is at my feet and would be most offended should he think I’m calling another pup adorable…). Your garden looks a treat. I’m missing my little garden at my home in Norseman. The garden in my house/home in Perth is giving me something to smile about, with beautiful Fragipanis flowering and passionfruit for my husband. We have a lot of birds here too and listening to them in the morning is a delight. Love the crochet too. I left mine home (in Norseman) so I am making little koala mittens for the poor koalas who have been burnt in our fires. The knitting of koala mittens is something that makes my heart beam, even while I regret the cause. I imagine they are very small! Now from this comment I take it you have two homes? I shall have to get my Australian atlas out and sort out where Norseman is – I know where Perth is 🙂 I love frangipanis and passionfruit – I grew both when the girls were young and we lived in Hawkes Bay for 12 years. Yes we have our house in Perth which is our family home and we rent a house in Norseman as that is where my husband has a job. Norseman is at the end of the Nullarbor. It’s actually a lovely spot and only 2 hrs away from Esperance, which is a beautiful spot with amazing beaches. The water is freezing though, brrr. I love frangipanis too they come in all sorts of colours, very pretty, and easy to create more. I’m not a fan of passionfruit, but my hubby is. I like the look of the vine and flowers though. We are on holidays, school holidays 🙂 as we work at the school. We have been renovating two of the bedrooms and getting the laundry ready to be revamped with a makeover so not too much slouching around this break. I have been sprucing up the garden as well. We are going home to Norseman for a break lol. Oh my gosh Pauline! You are such a marvelous artist. Since I am relatively new to your blog I had no idea!! I love your creativity ( and you should be proud of those eyes- they are fabulous!) What a lovely post. I did spy the veggies. I do look forward to spring and planting our veggie garden. So strange to realize that you are half a world away enjoying warm weather while we are in the middle of winter here. The world is so much smaller with friends from around the world that keep us in touch. I love it! It does broaden the bubble I live in!! 😊 Love your garden photos. You are a woman of many talents. I’m working on it Jan, I think it might take me a while yet! Thank you for those words of encouragement – every time I read a comment I get a little more hopeful 🙂 Isn’t it wonderful how we shrink and unite our world through blogging – I love to see the hits from non-English speaking countries too. I think it is wonderful that someone who maybe can’t read the words, looks at the photos and gets a feeling of unity too! I love your paintings, I love your garden, I love your creativity. 🙂 It looks like wisdom in those eyes (the close-up). It’s so wonderful to hear about and see summer on this freezing cold day here at the ranch. 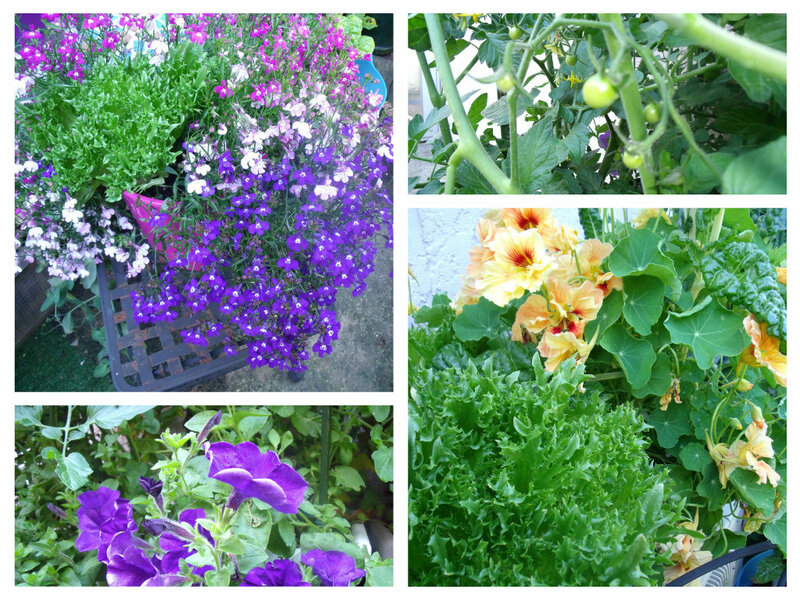 I’ll be dreaming of summer flowers and fresh vegetables tonight. Robin – thank you for that enthusiastic response! Isn’t it lovely to know somewhere in the world is the opposite of what we are experiencing. I hope you have a wonderful, restorative sleep! Pauline your paintings are simply stunning! They are so ethereal and dreamy, and I love the way you combine text with your painting. Do you have an Etsy shop or somewhere where you sell the prints? It’s great to see your gardening blossoming too, you (and your little helper) have done wonders with the space. I love the photo of Siddy – he is absolutely adorable! 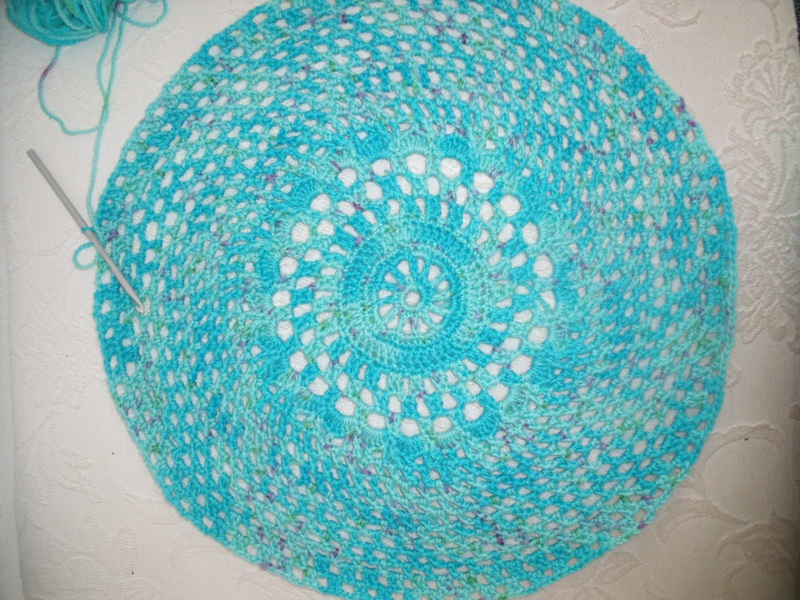 Great work with the crochet too, I particularly like the green colours together! I’m happy you like my paintings Jem – and I really appreciate the feedback. I do have an Etsy store 🙂 It is languishing a bit from under use, but it’s there. You can find a link to it at the top of my blog under the banner. It has a few originals, prints and postcards. Isn’t Siddy just the bee knees! I love him to bits! 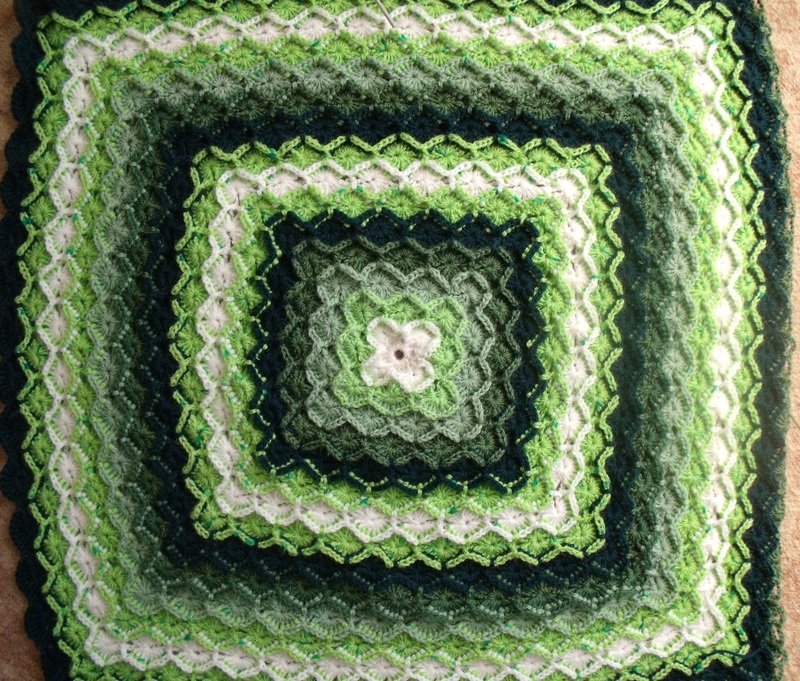 I love those greens in the crochet throw also – it is going to fit a king size bed in the end so will be pretty huge! It is also nicer in person than in the photo. Ha-ha Dani – a t-shirt! What a great idea 🙂 The Bavarian is going to fit a king bed and is for my eldest daughter – it has such a long way to go! The round blue thing is a wonderful pattern for a ‘Stevie Nicks vest’ which I am adapting for a rounder older person 🙂 If it doesn’t work out satisfactorily it will probably end it’s days as a mandala stretched over a canvas board and hung on a wall somewhere. How lovely to wake up and read this post, Pauline! To read the words of a woman who has found great contentment in life bring a smile to my face. Your life is full of creativity, both in the garden and on the canvas (I adore the older version). Siddy is a reflection of your contentment and i’m sure the two of you bring smiles to the faces of all who are around you. I’m so very proud of you for taking the class and for immediately using what you’re learning; for planting and caring for the garden; but mostly for growing in contentment! Love it! Wow, I love all the beauty that you have created and the sense of joy in your post! Sweet peas are gorgeous, aren’t they? I’ve just grown my first sweet peas and I’m about to harvest the seeds for planting again in a couple of months 🙂 That’s a good tip about the petunias, I hadn’t heard that before. I’ve just planted seeds for marigolds, thyme and chives to set up a herb planter soon and will see how it all goes 🙂 Congrats on the 150! Hello, and welcome! Thank you for popping in to my tiny urban garden. 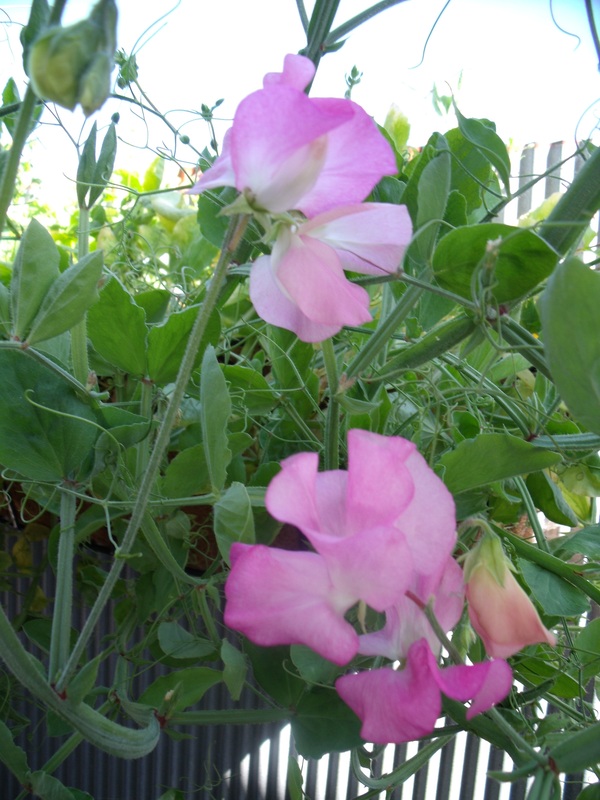 There is nothing like sweet-peas to gladden the spirits! The more you pick, the more they flower so you can give them away to everyone – and the scent is delicious! Good luck with your seeds. Pauline – you are such a busy bee – i am astonished at your creative output and not a little envious! Your garden as always, amazes – and we only know how tiny it is from previous descriptions but your pictures make it seem beautifully full and rambling – and those sweet peas – i love those! Dropping in on you is always a joy, I’ve discovered – always something lovely to see that you have created. And yes, the eyes have it. The colours in that picture are great together. Happy crafting, Pauline! Thank you Jenny:-) It’s just the perks of being retired you know. I have waited patiently for this opportunity to slow down and live each day doing things that make me happy. I am delighted that you enjoy dropping in and seeing what we have been up to. It’s the icing on the cake! I to adore sweet-peas. It was doubted by many that I would be able to grow them successfully in my tiny space – but they are in a tub in a corner and in a hanging basket on the fence and are flowering prolifically. Siddy is absolutely becoming more adorable every day! He’s quite special! So glad your sweet-peas are thriving 🙂 My maternal gran used to grow them in a thin streak of soil outside the kitchen window and there was always a profusion of them. I seem to recall they just wanted plenty of sunlight. It takes as much time out of the day to answer all these comments as to write the posts. 🙂 Such a horror to have so many people that care about you don’t you think. I just posted #149 today as I only write maybe once a week. Like you, I have so much else going on and know others have other things to do than read my little blog. What bugs me is so many followers that have never read one word I have written. They follow to get you to read theirs. I write, like you for the loyal friends I have made, be they one or one dozen. You keep up the work on your art! Let nothing get in the way or you will regret it. A few less posts won’t hurt us. We can be patient as we see the fine results. That is some wonderful work you have done. The crochet is inspiring as well. I may have to give it a go again sometime if I ever catch up with all the other things that are on my list to do. I remember saying often “how did I find time for a job?” I feel so sorry for people that retire and don’t know what to do with themselves. That will never happen to us. Siddy as more handsome than ever. What a face.I’m so glad you are enjoying the warm weather. I’ll take the cold anytime but know we need to to grow beautiful gardens. Yours looks happy. As for blue hair, well, it could be fun, funky and artsy but to me it just spells maintenance. I don’t have time for my hair either. It’s getting long and I won’t spend the money on cuts or perms, which I need both of. I just plop on a purple hat and call it good. You don’t need to respond to this. Save the time and keep painting. Just click like and I know you’ve read then off you go to the good stuff. Marlene, for heavens sake – you are the good stuff! If you take the time to read and comment I will never not respond – well not unless something dreadful has happened – I think it is like greeting someone, if they ignore you, that’s just plain bad manners. I don’t think I’ll get the blue hair either – I just like the thought that I could! I sometimes forget that I’m a mature person! Perhaps I should start gathering in some funky hats instead – Now there’s a thought! I have been working on the second Beacon painting today and it is almost finished – and I have to say I am really happy with it. I haven’t ever been this happy before so I’m guessing something has shifted. I think this course is really timely for me! Marlene I recommend crocheting. It is easy to learn, there are so many fun and inspiring blogs written by crocheters and you can make such cute things. It’s the perfect craft for a winter person! Thanks kiddo, I know you are not rude, ever. I started wearing hats when I got the Bells to keep the pain at bay on my head. My daughter thinks it’s cute but the good ones that fit well and do the trick are hard to come by. I’v almost worn out my purple hat. I did crochet for many years. Other creative endeavors pushed it to the back burner. I still do hand needlework but writing, reading, quilting, embroidery and so many other things have edged it out. Maybe once I’m settled I can think about it. Gave all my supplies to my grandniece. I’m at the pass it on stage. Your artwork is Stunning and I like where it’s going. You are a very lucky mum but I’d bet money your girls are as wonderful as your boys. No apple falls far from the tree. If you can raise good kids, you raise good pets. 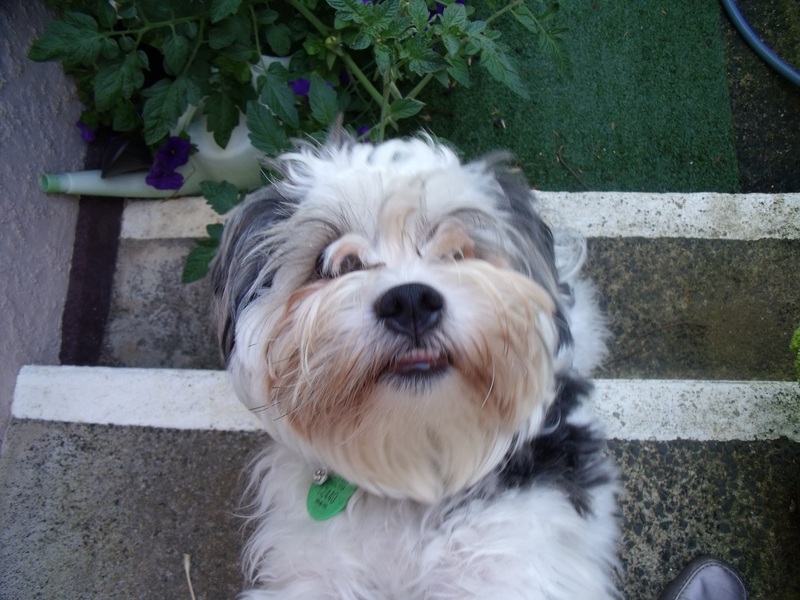 My Schatzie, Blossom and Buffy were the very best and everyone loved them, just like they loved my kids. And yes, our reward for the lousy husband department. I had 2 so I know. 🙂 Hugs my friend. I believe every woman over a certai age should wear a purple hat – so I’m glad you have one. I love hats, but they don’t do anything for me. That is a great wee poem! Thanks for the share! Thanks soooooo much for your garden pictures. It’s beautiful and looks to be fruitful and your Siddy is quite the cutie. A week or so ago, I was hoping you’d post on your garden (it snowed here on Tuesday and is still a beautiful world, but alas, I am a summer person). I also love your older, joyful craftsperson. She makes me smile and radiates a sense of peace and happiness. Good on ya and keep it up. Ah, show your garden whenever you like! I am puzzled at the length of time it takes for tomatoes, but know nothing about your particular growing conditions. From the water barrel description (and the recent call I read for mittens for singed koalas), I’m thinking dry. They like warm nights and when its arid, the nights are cooler, but I speculate. Looking forward to seeing more paintings, garden, and creativity in general! Pauline, even before you said that you were pleased with eyes, I kept saying to myself, “those eyes are gorgeous, Pauline is so talented”. You are an artist, please embrace this title fully. I love all the photos of your garden. I agree that you ought to pick the peas even if they are not quite ready! Sweet update on Siddy. He looks adorable in the pic posted especially for Jill. I haven’t written any posts for 2015 as yet, so you’ve got one less to read. Do enjoy your long summer days! Elaine – are you being firm with me? 😀 I just love all the support you offer to me with every post, you make me smile! Truly, you are so appreciated! Hahahahaha! I am smiling from ear to ear here about me being firm with you😄 Generally, we tend to brush off our strengths, it’s time to embrace what we are good at doing! You are a top notch artist, my friend. Have a great weekend! I hope to attend to my blog soon. I’m not a great photographer and our official one is working at her proper job so I do what I can. I’m the same with the crochet, hence the reason it is slow growing presently. But I do like to keep my hands busy, so I’m going to make some crochet cotton dish cloths! I love your Contented Crafter with blue hair. Please dont disapoint me now and tell me you don’t have blue hair. Because honestly if you don’t, you really should have! Gorgeous crochet and Siddy is the cutest thing ever! Okay, you are the second person to encourage me to have blue hair – one more and it may have to be done! 🙂 Yes Siddy is the cutest thing ever – or, as we tell him constantly, possibly the best puppy in the whole world! Which sentence sends him rushing to sit beside the treat drawer with a face full of hope. No wonder he is rotund! Love, love, love this post. The garden pic is great. Right now I’m shoveling snow in freezing weather. The Siddy pic is adorable. Such a happy little guy! Your art work is WOW! I love it. So much artistic talent. You just made me smile too! It’s so amazing to think of you shovelling snow and snuggling beneath that huge duvet with the cat and blowing your nose because of the cat allergy while I swan about in my summer garden and sit with my feet on the puppy’s cooling mat in the evening………. Levity aside, your garden looks prolific, your art seems full of life, and Siddy seems happy. In sum, your 2015 seems to be off to a GRAND start. With summer temps to boot! Beacon of Light is beauuuuuutiful Pauline, I wish I could paint half as good as you. I know how it is when other goals take priority even when you don’t intend it to, but I wish you all the best with the different things you have going on, and for the New Year. Much Love hunni, glad to hear from you 🙂 and I’m looking forward to more of your paintings, and Siddy, and that beautiful garden. Cheers to your joy for summer and being able to enjoy it! Here’s a song for you … and you’ll love the hair. https://www.youtube.com/watch?v=wvUQcnfwUUM … Meanwhile, as you are basking in warmth, please think of me as we are immersed in 0 to -17 C.
Beacon of Light is my fav of your creations above. Keep smiling! Ha! That is a great song isn’t it – and it’s stood the test of time too! Thank you Frank! And oh dear, -17C does sound rather cold. I would be shivering here on the frosty mornings that give us -1C . I’m so happy to hear you have a favourite painting! … and it’s windy today as well … thus it feels even colder. That’s OK … I know you’ll enjoy it. Oh Pauline…thank you, thank you! You’ve made my day, not only with your beautiful paintings and lovely garden photos, but Siddy!!!!! I might have to print that picture and frame it. That face! He is just the sweetest! I’m so impressed by your progress, Pauline. Of course your work was magnificent before, but you’re obviously learning so much and in such a short period of time. Keep it up! Enjoy the hot weather…I’m jealous! It was 8 degrees yesterday morning as I walked from the parking garage to my building. It is absolutely thrilling to read this post and hear how incredibly happy you sound! I could respond to lots of the things you wrote (the garden!, that dog’s face!) but, really, the best part is that you’re taking the art course and doing that for YOU! I have to admit that I’ve loved your long comments on my posts and have noticed that you did the same for others, in your generous way, but I’ve really, truly wondered what that was taking away from our own work. I’m glad you’re taking some of your time back and using it to do what you love! I feel so zingy with all this art going on – it’s great! 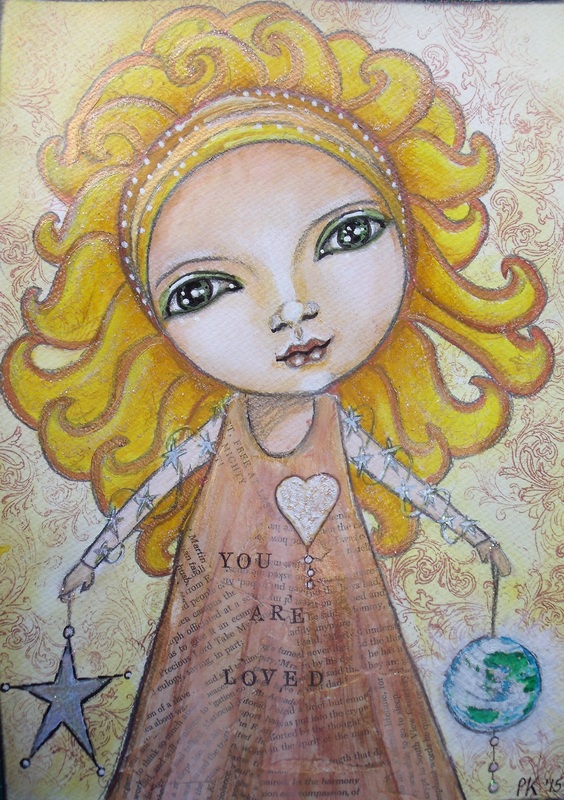 Lovely art… so pleased that you are back painting and really looking forward to some new postcards! It’s good to be learning something new isn’t it – never too late and all that! Isn’t the weather spectacular! It has been eons since I enjoyed such a summer – well ten years at least! As to the painting – who knows! Anything could happen this year! Summer is here in full force today. A true Canterbury summer! I am glad you are out and about and enjoying it, Otago style. I know what you mean about not enough hours, when you are not working don’t you spend alot of time wondering how you ever managed to fit in a job?! I haven't been this busy since I gave up teaching! I have found it amazing what happens when you have nothing but time. Suddenly my world is full of new activities and new people as well as all the old and well known things and folk! And blogging keeps us all so busy too! I really thought my tomatoes weren't going to fruit. I was reading about the guy who grows his around the outside of a big drum filled with water – I'm sure he said it was five weeks from planting to fruiting. I planted mine back in October, so it's been four months and now I'm wondering if they will ripen before the sun leaves my courtyard in late March. Why did yours all die? I'm loving painting in my new space – so much room and such a lovely, colourful space to be in – maybe that is helping the quality too! It’s great you have been able to fill up your days with Pauline stuff, just doing what you like. I saw a photo of the guy with the tomatoes around a drum but didn’t read it. Yours should be fine, we plant ours in Oct and generally don’t start picking till late Jan/early Feb. I have a little idea why they died but Roger looks at me very innocently (you know the too innocent look?) when I say anything. We have problems with pyscilid (sp) bug here and he was panicking a bit about them…I have a feeling he secretly sprayed them and went overboard. He knows I don’t like sprays so won’t admit to it! Tell Roger to plant petunias under his tomatoes next year – zero bugs! [A tip Robbie gave me!] I thought I saw a dusting of white fly briefly in late Nov or early Dec but they all disappeared really quickly and haven’t returned. My toms are so small I don’t think they will be edible for ages yet – but I might be panicking now! I love your garden, it’s lovely! We are in winter now and it’s below freezing tonight. Still have a couple more months before Spring, but the temp is supposed to get warmer late next week. 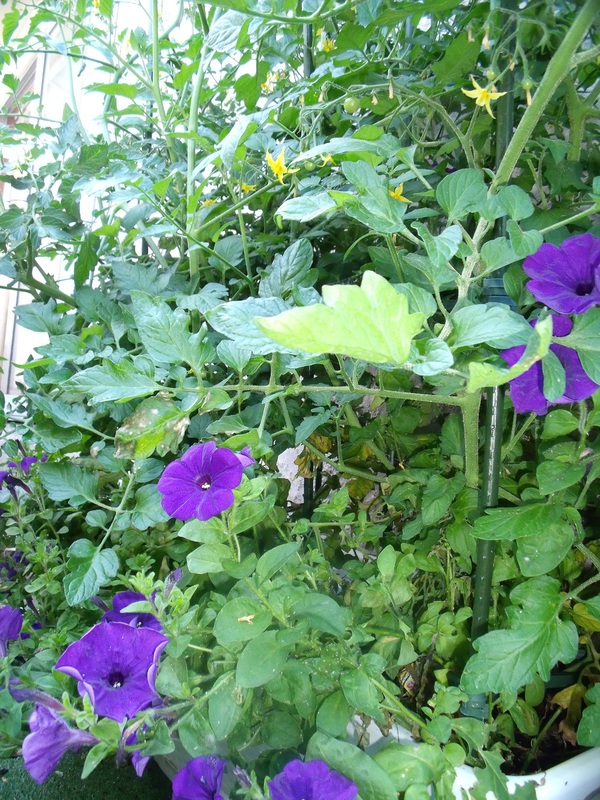 I’m happy to see photos of flowers and tomatoes, will be late May before I have those planted.